The 15th edition of Elephant Festival kicked off in Nepal's popular tourism destination Chitwan on Wednesday with the participation of around 100 elephants. The five-day event, organized by the Regional Hotel Association of Sauraha based in Chitwan National Park, was inaugurated by Nepali President Bidya Devi Bhandari and attended by government officials, tourism entrepreneurs and a few hundred spectators. Nepali president highlighted the importance of the elephants in tourism, mentioning that elephants have religious and cultural value in Nepali society. The president also witnessed the 15 minutes long elephant football with much interest and enthusiasm. On the occasion, Nepali Minister for Culture, Tourism and Civil Aviation Rabindra Adhikari said that the festival is instrumental to boost tourism of the Himalayan nation. "Elephant festival has been included in our annual tourism calendar as the much-celebrated international event. I believe that it will contribute in attracting more number of foreign tourists in the country," the minister said. 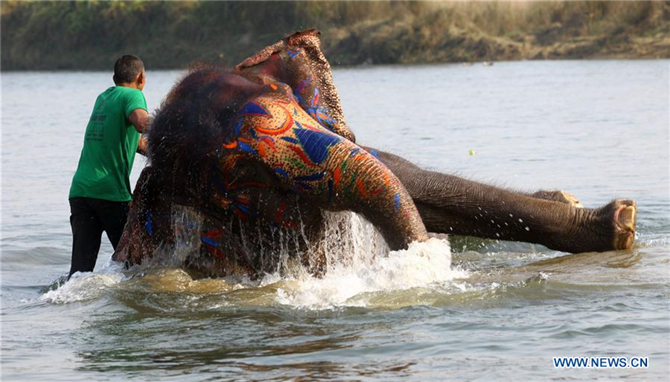 The annual fiesta aims to bring humans closer with elephants, encourage wildlife protection and conservation and promote tourism, particularly in Chitwan. "We have been organizing this festival annually to enhance human-wildlife relations," festival coordinator Suman Ghimire told Xinhua. According to the organizer, the festival will showcase elephant walk, elephant football, elephant bath, elephant beauty contest and elephant picnic among others. Elephant picnic was added to the schedule a few years ago to provide affection, care and leisure to the elephants. Chitwan National Park, which lies some 160 km away from the capital city, is a pioneer hub for elephant adventures, especially for jungle safari. Besides the elephant adventures, the festival also features cultural procession, ethnic dances and musical programs with stalls of a variety of local foods. Hundreds of domestic and foreign tourists visit Chitwan every year to experience this incredible fiesta, which will conclude on Sunday.